Plymouth’s Derriford Hospital is currently the top UK recruiter of patients to a study investigating the benefits of diagnostic imaging for people receiving treatment for serious heart conditions. The study involves researchers from Plymouth University Peninsula Schools of Medicine and Dentistry. 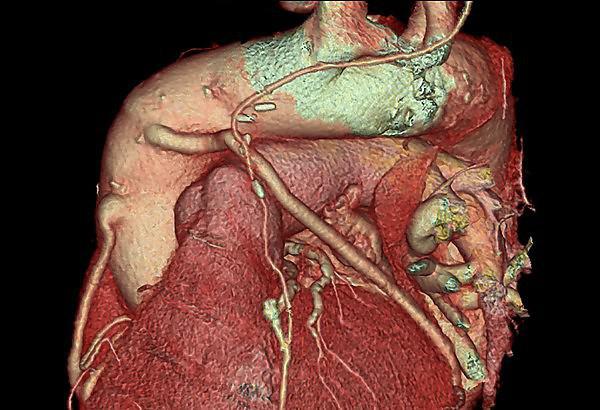 The RAPID CTCA study is looking at the effect of early CT Coronary Angiography in the evaluation, treatment and survival of people with suspected or confirmed Acute Coronary Syndrome (ACS). It is funded by the National Institute for Health Research, which is the research arm of the NHS. ACS is a term given to various heart conditions, including a heart attack and unstable angina, caused by a reduced amount of blood flowing to a part of the heart. Treatments can help to ease the pain, improve the blood flow and prevent future complications. Derriford is one of 23 hospital sites in England and Scotland where the study has opened. Of the 131 people recruited to participate in this research in October, Plymouth Hospitals NHS Trust enrolled an impressive 45. By 20 December 2015 there were a total of 53 patients participating in this trial with PHNT – maintaining Plymouth’s top position nationally for recruitment performance. The Principal Investigators at Derriford for this study are Professor Jason Smith, Consultant in Emergency Medicine and Professor Carl Roobottom, Professor of Radiology, Cardiothoracic Radiologist and Peninsula Academy Head Derriford Hospital and Plymouth University Peninsula Schools of Medicine and Dentistry. The study, which is co-sponsored by the University of Edinburgh and NHS Lothian, started in January 2015 and is currently scheduled to run for three years.